Happy 80th Birthday SPCA Texas! The animal rights movement in the United States is nothing new. But the “Society for the Prevention of Cruelty to Animals” was something of an anomaly when the New York State Legislature granted Henry Bergh a charter for it in 1866. In the more than 150 years since, the ASPCA has been advocate for the netherworld of animal welfare. The Texas branch of the SPCA was incorporated on September 22, 1938 and works in conjunction with state and local leaders to oversee the well-being various non-human creatures (not including, of course, politicians and child molesters). Currently, the ASPCA is monitoring the aftermath of Hurricane Florence, which hit the East Coast last week. After the debacle involving Hurricane Katrina – and the literally millions of animals forcibly left stranded to be killed or die in agony – people demanded better protections for human and animal survivors of natural or even human-made disasters. But, just as importantly, we now understand that animal abuse is tied to more severe problems in society. Some of the world’s worst serial killers, for example, had a history of animal cruelty. While most people who do something mean to an animal won’t turn into a Hannibal Lecter-type monster, we take it seriously now and often involve law enforcement. I implore everyone to help in any way possible. Besides, animals actually appreciate when you help them out. Tami Manning, left, and Alisa Lee, run the Texas Siamese Rescue in Corinth. I reported back in July about the Texas Siamese Rescue in Denton County, Texas; an organization devoted to rescuing Siamese cats and providing them with good homes. Tami Manning and Alisa Lee had taken over the group last year, after its previous owner died. But, when Manning and Lee inherited the organization’s 179 cats, they also inherited its outstanding debt of $244,000. If the duo could raise $40,000 by the end of the year, that amount would be waived from the overall debt amount. Now, though, Texas Siamese Rescue is facing closure by year end, as the group hasn’t been able to recoup its losses. They’ve been able to reduce the number of cats, however, through foster homes and have been able to pay back $10,000 so far. A donor has agreed to match up to $5,000 in donations; at this point, up to $3,500 has been matched. But, there’s still the possibility the group may have to euthanize some of the cats if homes can’t be found for them. Donations can be made to: http://tx.siameserescue.org/TXdonate.php. They can also be sent to: 1123 N. Corinth St. Corinth, TX 76208. In the ongoing calamity that is Hurricane Sandy, the American Society for the Prevention of Cruelty to Animals remains determined to rescue vulnerable animals. Here’s where everyone can help. Text either ANIMALS to 20222 or PREVENT to 25383 to donate $10 to the ASPCA, or simply visit the ASPCA web site. Unlike Hurricane Katrina, there has been a concerted effort to save animals along with people in the wake of Hurricane Sandy. As many coastal residents evacuated ahead of the storm, they brought their pets with them to shelters. And, for those trapped in their homes by the floodwaters, their pets are being rescued along with them. This is in stark contrast to the Katrina debacle, when not only were animals refused entry into shelters, the Coast Guard and other rescue personnel forced people to leave their pets behind. I’m not a cat lover, but this is a great story. 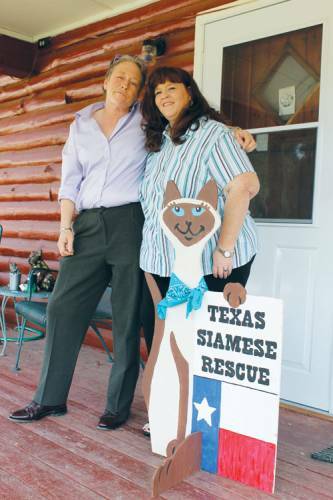 Two women in Denton County, Texas, have taken over the Texas Siamese Rescue organization. Last year, the group faced possible closure after its founder died, while the 179 cats still awaiting adoption faced animal control intervention and therefore, possible euthanasia. But then, Tami Manning, who’d volunteered at the rescue for about six years, and her partner, Alisa Lee, stepped in and organized the few volunteers to help care for the cats. “We love this place to work, but it wasn’t our ideal of a home,” Lee said. Their passion for the cats grew during this last year of balancing the bills between their own incomes and the rescue’s finances. Texas Siamese Rescue began in 1998, and its volunteers have helped rescue and find homes for nearly 20,000 cats. But, in December 2010, the founder and director became ill and passed away months later, leaving behind a massive debt on the property and the 179 felines. Lee said she and Manning went through all the rescue’s finances, discovering that $244,000 was due on the 3,500-square-foot house on a ranch in Corinth and that taxes hadn’t been filed since 2000. Luckily, she said, the rescue somehow maintained its 501(c) (3) status. The owner of the property lives in New York and has agreed to forgive a large portion of the debt, giving the rescue a year to raise $40,000. Lee and Manning have implemented dozens of changes to help meet the deadline, but they said they’re still in need of donations. The two have overseen the re-branding of the rescue, revamping the logo, reaching out through social media to gain volunteers and adoption interest, and cutting the cost of operations by two-thirds by reducing energy use, switching power companies and using coupons. They even have a volunteer photographer to take professional pictures of the cats, making them look their best for potential adopters. But perhaps the biggest change they made was an open space for the cats to live and socialize. Instead of cages lining the walls, the rescue has a large room filled with climbing fixtures and cushions so the cats can play and nap peacefully. Adoption fees range from $75-200, depending on age. Lee has also developed a sponsorship program, starting at $25, for people who want to help with the cost of caring for a cat but can’t take on any more pets at home. The option is popular among children who see the rescue’s cats at adoption fairs and can later go online and see their sponsored cat. “And they never have to take them home, and we do all the work,” Lee said. But once a cat is adopted, Lee and Manning’s work doesn’t end. They offer support, training and tips on how to help a new cat adapt and they’ll take a cat back for any reason. Visit www.Tx.SiameseRescue.org for more information.